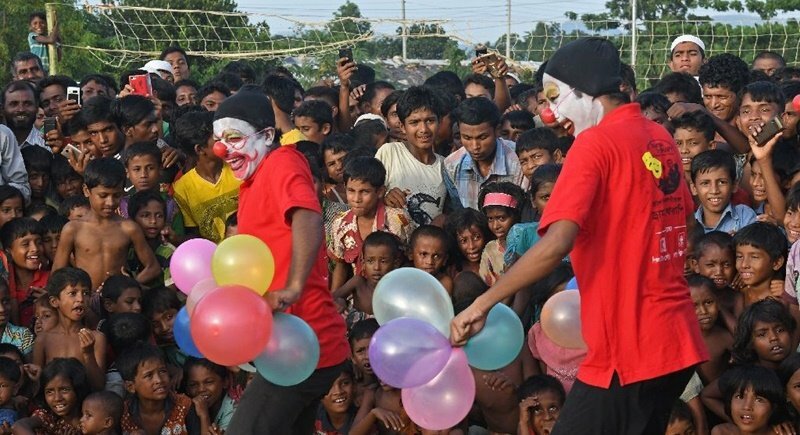 BANGLADESH: The Rohingya boys and girls shrieked with delight as the clowns juggled hoops and somersaulted, their red-nosed antics provoking a sound rarely heard in the world’s largest refugee camp – children's laughter. The clowns have been providing much-needed levity in the crowded Bangladesh camps, where hundreds of thousands of traumatised Rohingya children spend long days in bleak and difficult conditions. Mohammad Noor lives with his mother and three siblings in a makeshift shanty in the teeming Kutupalong camp, where a lack of food and water means a constant struggle to survive. The 10-year-old fled Myanmar in October after his father was killed in brutal violence by the army that the United Nations has likened to ethnic cleansing. The impromptu circus in a dusty clearing is a welcome distraction from the horror at home. “It is hilarious. I have never seen anything like it. My friends and I were just laughing and laughing,” he said, as a quartet of painted clowns performed skits before a huge gathered crowd. Theatre groups in Bangladesh have a record of using “drama therapy” to lift spirits in the most depressing of circumstances. One troupe performed for the survivors of a factory collapse in 2013 that killed 1,100 garment workers, while another hosted shows in a small village in Bangladesh’s south that lost nearly 50 children in a tragic road accident. In the Rohingya camps, where many lie sick or injured mourning the death of family and loss of their homelands, laughter is sorely needed. “Our sole aim is to bring laughter to the Rohingya,” said Rina Akter Putul, a veteran acrobat and the lone female member of the group. The UN estimates 60% of the more than 600,000 refugees to arrive in Bangladesh since late August are children. Many crossed the border alone from their villages in Myanmar’s westernmost Rakhine State after their parents were murdered and communities driven out by state-sanctioned violence. Charities on the ground say children are in dire need of emotional and mental support after enduring such trauma on their difficult journeys. “I am sure our show will live in their memory for some time. It won’t erase their scars, but it will boost their confidence,” said Faker Ali, an acrobat who has worked in drama therapy for more than two decades. But it’s not just the children who benefit from the visiting performers. Among the spectators who flocked to a recent show were countless elderly Rohingya refugees, clapping and smiling as the acrobats whirred rings and bars. Life has been a gruelling quest to survive for older generations of the stateless Muslim minority. Many have escaped past pogroms in Rakhine and lost family and friends in bitter cycles of ethnic violence. Rohingya are a reviled minority in Myanmar and are denied citizenship, education and opportunity by the Buddhist-majority government that regards them as illegal outsiders. Most have enjoyed few if any luxuries in their lives – making the circus performance all the more thrilling. “We hardly have any fun,” said Nesar Ahmed, 38. Even during major Islamic festivals and weddings, there is little in the way of entertainment, he added. “Life in Arakan (Rakhine) is grim,” Khairul Amin, a 63-year-old grandfather, said as a boisterous crowd, young and old, jostled to meet the visiting clowns.